Sleeps 8, 4 bedroom and a spacious open floorbedroom stone house. Beautiful accommodation located on the edge of the picturesque village of Aubeterre sur Dronne yet close to all the activity you and your family may wish for. This fully equipped house has a large terrace with BBQ. Just above the house taking the stairs you will find the nice private pool overroaming the peaceful environment. The house is set up in several parts which gives privacy if you want. You enter in the large kind living kitchen with big table and fireplace. One double bedroom with television on this level.A large bathroom and toilet.Stairs down to a grot where we built a little bar, next to the salon living room to relax on the couches. TV and DVD.Next the salon a bedroom with 2 single beds.Then stairs to the open floor with a double bed and 2 singles.And one floor up another large bedroom with double bed toilet and shower. Hello! My name is Carmen Hollander, i am Dutch and live in France for 7 years now with my French partner Didier Lafrais who lives in this village all his live. We own a restaurant (La Taverne) in Aubeterre and a wineshop in Chalais. 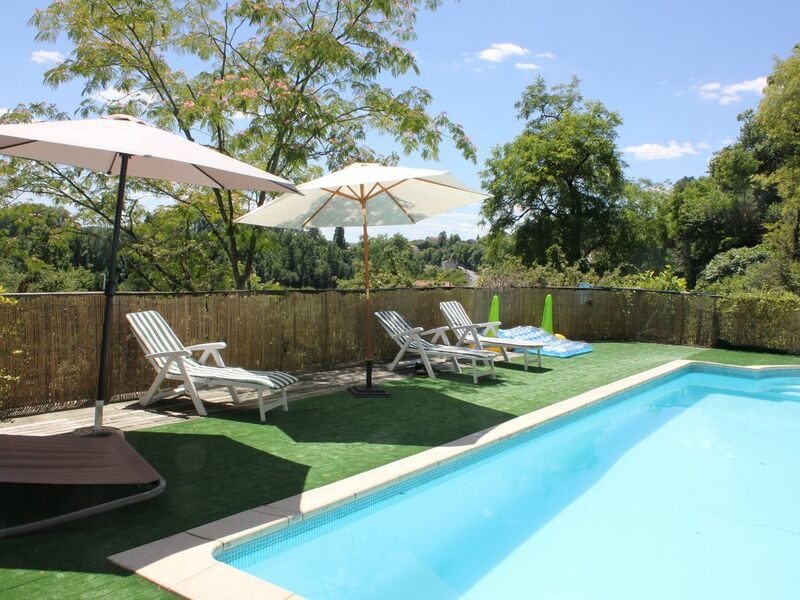 We have 2 holidayhouses to rent out (Bellevue et Monolithe), both with private swimming pool. Off course we can highly recommend our houses,they are spacious and comfortable. Livingroom with TV/DVD and several couches.Audio. A riverbeach is on 300 meter distance, nice walk over the bridge along the river. Activities as canoeing, tennis, fishing. Beach/snackbar present. A big supermarket is 11 km from Aubeterre. Every Sunday morning there is market on the square.There are several markets in the villages around during the week.